The Pleiades, the Hyades and the Beehive cluster are all amazing in their own right, but, to pose a straightfoward question: which is which? Imagine that you're separated from any kind of star chart. So how, other than searching by Right Ascension (RA) or Declination (DEC), could one know where to look? The Pleiades is also known by its Messier catalogue number M45. 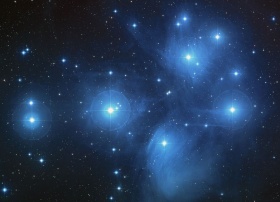 Although nicknamed the Seven Sisters (map identifying stars of the Pleiades), M45 is actually formed by over 100 stars. It's located at RA 3:47, DEC +24.07 with a visual brightness of 1.6, and apparent dimension of 110.0 arcminutes. The Hyades, also known as Melotte 25, can be found at RA 4:27, DEC +16 with a visual brightness .5 magnitude and apparent dimension of 330 arcminutes. Both the Pleiades and the Hyades are open star clusters in the constellation Taurus (the Bull) and can been seen with the naked eye. Locate the Seven Sisters perched on the Bull's right shoulder. They lie about 4 degrees from the ecliptic so are frequently occulted by the Moon and other planets (which proves to be great observer eye candy!). There is quite a bit of nebulosity located within the Pleiades, especially around the brightest stars. I enjoyed watching them appear to sit on the mountain summit where I lived outside Mexico City. Greek mythology relates the story of the Pleiades placed in the sky while seeking refuge from Orion's nonstop pursuit. The Hyades, 150 light-years away from Earth, outlines the Bull's face and is a loose V-shaped cluster of white stars. It's less populated and younger than the Pleiades. While the central star group is about 10 light-years in diameter, the outer group is spread over 80 light-years. Astronomical studies of the sky show the Hyades moving eastward in the sky toward Betelgeuse in Orion. It should be noted that the bright red star, Aldebaran (Alpha Tauri) - the eye of the Bull - is not a member of this cluster despite lying in the Hyades field. It is thought that the Hyades may have a common origin with the Beehive cluster (located in the constellation Cancer), due to their similarities in proper motion and age. The Beehive cluster lies at RA 08 : 40.1, DEC +19 : 59, with a visual brightness of 3.7 magnitude and apparent dimension of 95.0 arcminutes. Known also as Praesepe (Latin for manger), it's Messier No. is M44. When observing it, look for the eclipsing binary star TX Cancri. Epsilon Cancri is also an eye catcher and worth spending some time to find.